Cutting costs has always been a crucial element for any business looking to increase its bottom line. And these days, it’s not just buyers and purchasing managers who must be vigilant; every department, including sales, must find ways to cut costs. Nothing eats into profits faster than having to handle a single order twice. Manual orders are much more prone to errors. When that happens, you not only lose profit through the extra time and labor processing an order a second time, but also through restocking and handling. A quality B2B ecommerce site can provide clear information on a product to eliminate common errors. Orders that are called or faxed in must be processed by people. That labor not only costs money, it costs time that could be spent pursuing new clients. Today’s B2B eCommerce can even automate your customers’ approval processes, saving them time and money. A good B2B ecommerce platform, combined with a strategic approach to growth, can radically accelerate and reduce the cost of growth. 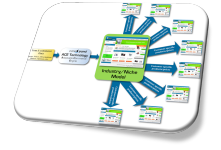 You can create B2B ecommerce models that can be scaled rapidly across specific niches and markets. If you want to see real world examples of these increased profit centers and rapid scale, strategic growth, be sure to claim your free consultation on this page.